I go in and out of different cooking fits. Recently, I’ve taken to making crepes. 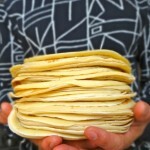 This is a basic crepe recipe that I used as a tortilla substitute to make enchiladas. And this week, we celebrated Ned’s birthday, and I used this recipe to make his layered crepe birthday cake. I can make about 24 – 7” crepes from a batch of this batter. Of course if you desire for large crepes, you’ll end up with fewer but still have a plentiful amount of the velvety, pliable rounds. And if you’re not making enchiladas or a layered crepe cake, that’s quite all right. Just let your imagination run wild with all the goodness that you can stuff these with. In a medium mixing bowl, whisk the eggs. Then, add the milk, salt, oil and water. Whisk the ingredients well. Next, add the sifted flour and whisk until there are no lumps. Then, heat 1 teaspoon of oil in a skillet over medium heat. Once the pan smoke begins to surface from the pan, ladle about ¼ cup of batter into the center of the pan (I used an ice cream scooper) and swirl the bottom of the ladle or scooper to form a 7-8” round. Cook until the edges come up easily with a spatula, about 1 minute. Then, loosen the crepe, flip over, and cook for an additional 30 seconds. 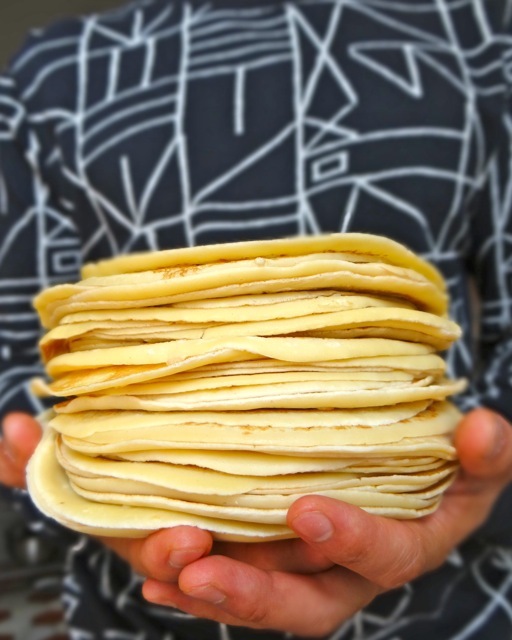 Once cooled, crepes can be refrigerated in an airtight container or food storage bag for up to 4 days.